LOS ANGELES, CA / ACCESSWIRE / June 22, 2016 / Piotr Kielkowski is pleased to announce the launch of his innovative and revolutionary Smart Kitty - automatic litter box for cats. The new litter box helps maintain a clean aroma kitty litter space and makes it even easier for pet owners to take care of their beloved cats. Kielkowski and the rest of the team that is responsible for this new product began with a simple problem: how to make litter boxes cleaner, easier, and more efficient. From this small seed, Smart Kitty's development team introduced ground-breaking technology to create a unique product. "It all starts when the cat enters the box; dynamic sensors immediately register when it enters and trigger the automatic brush as they leave," noted Kielkowski, adding that without any action on the owner's part, the brush scoops the droppings and puts them into a special odor-proof sealed container. "The self-cleaning Smart Kitty alerts the cat's owner via a free app for iPhone and Android every few days to a week when the special container needs to be discarded. The high tech elements make the process streamlined and hands-off." 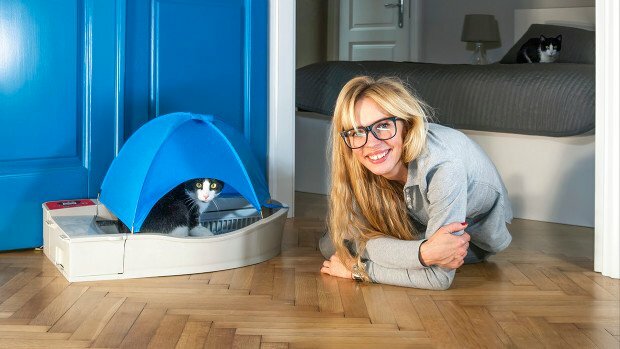 By fully automating the litter box, Kielkowski said, Smart Kitty allows owners to enjoy their lives, while staying fully informed via their phones. "With comfort, ease, and quality for both owners and cats, Smart Kitty has used technology in a bold and ground-breaking way that is sure to influence design for years to come," he said. Even though the automatic litter box was just recently launched, Kielkowski said it is already getting a lot of attention from cat owners who are grateful to have an easier way to tend to one of the least-popular parts of sharing a home with a feline fur baby. In order to help pay for the production costs associated with the new Smart Kitty litter box, Kielkowski recently launched a fundraiser on Indiegogo. He hopes to raise $40,000 through crowdfunding. To learn more about Smart Kitty and/or to make a donation to the fundraiser on Indiegogo, please visit https://www.indiegogo.com/projects/smart-kitty-automatic-litter-box-for-cats#/. Smart Kitty is a top-quality automatic and self-cleaning litter box. The newly-released littler box features dynamic sensors that "know" when a cat enters the box. One the kitty exits the litter box a brush will automatically scoop the droppings and puts them into a sealed container. 08:42a Grown Rogue Announces Proposed Acquisition of Decibel Farms, Inc.